Start your morning right with a beautiful morning walk through the newly revitalized Queens Quay by the water. Now, although the bike lanes, walking paths, and street car lanes are getting dangerously confused and mixed up, just keep your head up and enjoy the views. Head east towards St. Lawrence Market place for breakfast, where you’ll find some of the city’s best Peameal Bacon Sandwiches at either Carousel Bakery or the Paddington Pump (drool). Need a good coffee? Don’t bother with the chains and Tim Horton’s crap. That stuff’s good for on the run, but take your time to enjoy some of Toronto’s best coffee at some great cafes like the Sam James and Dineen. Spend your afternoons seeing everything that the city has to offer. I won’t bother explaining the typical tourist things to you (CN Tower, AGO, ROM, etc. ), but leave the beaten path a little to check out some of my favourite areas. My all-time favourite sunny afternoon hangout in the city is Kensington Market. Just off the main streets of Chinatown, Kensington Market is home to some of the cutest little shops, markets, cafes, and even Toronto’s No. 1 Tattoo Parlor. Want an afternoon full of art? Once you’ve checked out the AGO, be sure to head to the Gardiner Museum, the Power Plant, and the Ryerson Image Centre. Check out Centre Island, Shakespeare in the Park, the expensive shopping of Bloor St. and Yorkville. I love it all. Check festival schedules too! 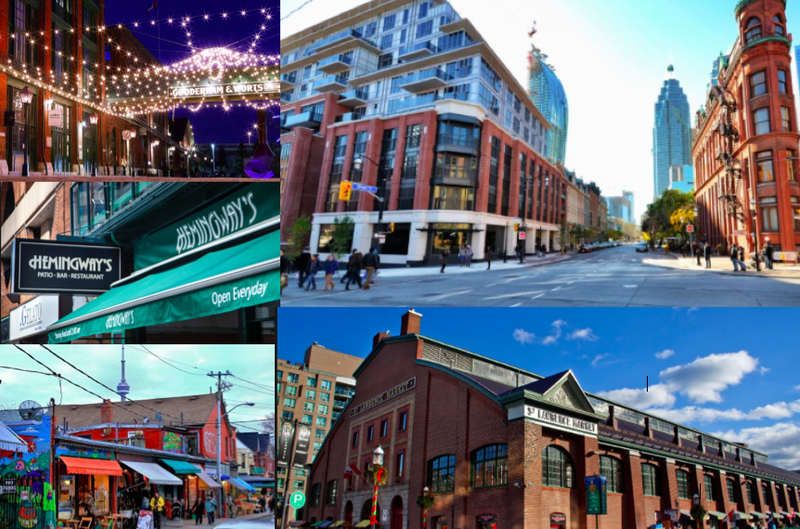 You wouldn’t want to miss some of the city’s cool food fests or Open Doors Toronto. Now to end your day, it’s got to be a rooftop patio, amazing restaurant or club, am I right? Head over to Hemingway’s rooftop patio on Cumberland St., my favourite patio in the city. Good food is all around and I like too many hot spots – but to name a few check out TLP Sandwich Co., the El Catrin patio, Spice Route, Terroni, or Salad King. Need a good dancing spot? ‘Shake a Tail’ at Sneaky Dee’s is my ultimate, but check out live music at Grace O’Malley’s, or some jazz at The Rex, just avoid the basic bitties on Adelaide St.
And when in doubt, to plan your trip and food destinations, your best bet is to check out blogTO, my go-to site for everything Toronto. What are you favourite Toronto gems?